This instructional, which I origionaly posted last year, has been updated. As a tea drinker who uses a collection of vintage unglazed teapots, I have over the years found various ways to reset these pots. I have gone through each of the steps below, with good results, so thought I would locate the information in one area for everyone. After getting a very dirty old yixing pot I had to go one step further, so am sharing the whole process with you. Also, a few 60’s F1 pots had been stored in damp conditions without air for decades, these pots took several years to reset, simmering, air drying in the sun on a window sill, each year testing the water to see if progress was made. At that time I did not know about using Sodium Percarbonate for cleaning pots, it is possible had I used it resetting time could have been reduced to a few weeks. 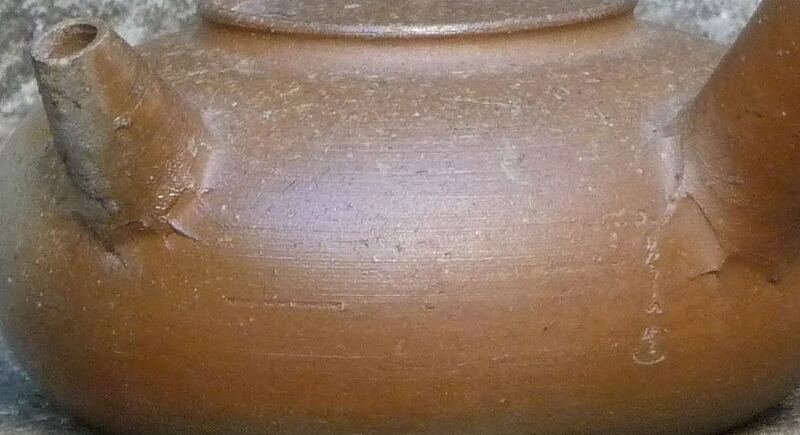 I have only done this with pots from 1960s forward, older pots may need even greater attention and care. If you have reset older unglazed pots, or very thin ones, please share what method you used. 1. Place teapot in room temperature filtered or spring water for two days. Fully immerse teapot and lid in water. 2. On the third day put the teapot into a large stovetop pan, with a trivet and a towel wrapped around the bottom of the pot and lid. The cloth prevents rattling of the teapot and lid to the sides of the pot and each other when water is simmering. Simmer the teapot lightly for 30mins-1hr. Do not boil. Stay nearby to listen and make sure teapot is not rattling against the pan or lid. 3. Turn the power off and let the pot cool down overnight. 4. Next morning visually inspect the water. Does it look clean? If so, how does overnight water taste? If the overnight water looks and tastes clean, the pot may be ready to use, if not repeat A, or proceed to next step. 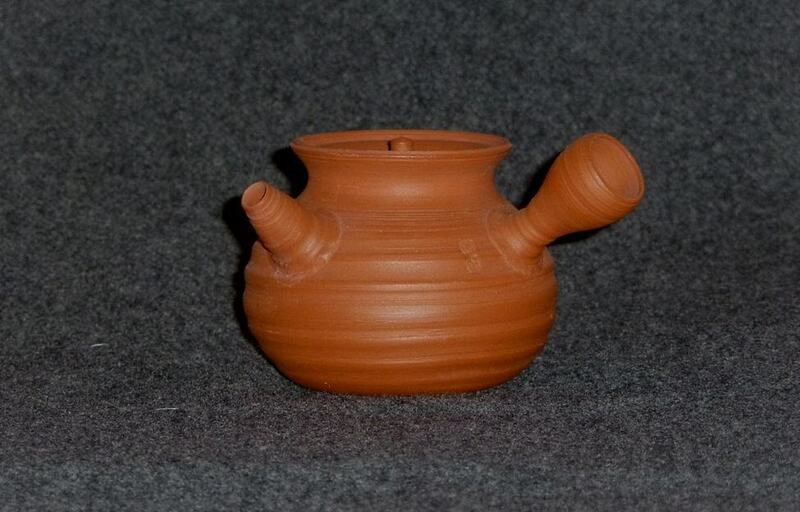 Rinse pot with very hot water. 1. Put a large pan on the stove, with a trivet and a cloth lined inside. Fill pan 3/4 with filtered water. The pan should be large enough to completely submerge the teapot. To prevent contact rattling; place pot inside pan using cloth to separate it from metal and to separate lid from body of pot. 2. Bring the water to a high simmer, reduce heat to a simmer, and gently cook for 1hour. 3. Allow the water to cool with pot inside. 4. Discard water setting pot aside. Rinse pot with very hot water. 5. Refill the pot with filtered water, bring to a boil, and add a few tablespoons of tea leaves that are not fancy or leaves that you used a few times already. Turn off the heat, cover the pot and steep the leaves for 30 minutes. Strain out the leaves and return the teapot to the tea letting it rest overnight. 6. Wash pot with hot water, place pot in bowl, drench with very hot water and after a few minutes hand dry with soft cloth and place in sunny spot to thoroughly dry (like a window sill). 7. Fill teapot with just boiled filtered water, let cool overnight. Next day taste water, if distasteful repeat steps 1-6 several times and or proceed below to C.
8. If teapot water tastes fine, use cleaned teapot as a tea pitcher (with similar tea you intend to dedicate it to) for a week or two to reset pot. 1. Lightly scrub with Baking Soda, using non abrasive material so as not to scratch clay. 2. Follow steps 1-4 in B. Resetting Old Yixing, and repeat these steps adding 3 TBS Baking Soda. Simmer for 1hr. After pot is somewhat cooled lightly scrub pot again, using non abrasive material so as not to scratch clay. I’m not using chlorine in this step because chlorine will not penetrate porous surfaces, only the water penetrates, while chlorine stays on surface, leaving mold's roots alive and eventual having mold return. Percarbonate by-products are non-toxic and environmentally safe. 1. Put 1TBS Percarbonate into vessel large enough to submerge teapot into (like pyrex pitcher) & put 1TBS of Percarbonate into teapot. 2. Boil filtered water & pour into pot & holding vessel. Stir the mix. Place lid on teapot. 3. Let it cool & then rinse & lightly scrub where needed again with toothbrush or nonabrasive cloth. 4. Rinse a few times with hot water. 5. Put a large pan on the stove, with a trivet and a cloth lined inside. Fill pan 3/4 with filtered water. The pan should be large enough to completely submerge the teapot. To prevent contact rattling; place pot inside pan using cloth to separate it from metal and to separate lid from body of pot . 6. Bring the water to a high simmer, reduce heat to a simmer, and gently cook for 1hour. 7. Discard water setting pot aside. Rinse pot with very hot water, and towel dry. 8. Let it dry completely preferably in the sun. 9. Fill teapot with boiling filtered water and let it sit overnight. If no off taste is present then you can now use the teapot. 10. Use cleaned teapot as a tea pitcher (with similar tea you intend to dedicate it to) for a week or two to reset pot. After boiling in Baking Soda some stains remained. After Sodium Percarbonate all stains are gone. Perfect, if you go to step 2 just make sure not to let the lid or pot rattle in the stove top pot-and protect with cloth or trivot and keep a watchful eye-ear. I did it years ago because everyone said we should. I don't see a point in doing it anymore. Now I just scrub an unused pot with warm water to remove any dust/clay. Then I'll over brew cheap tea in and it's ready to go. If it's dirty or moldy than I'll give it a bleach bath. Soak in fresh hot water a few times. I'll finish it with a tea soak. I suspect the origins of boiling came about outta people's fear of using bleach. Seems we each have our own encounters with dirty, smelly, moldy pots. In my case, as you can see from the 1st before & after picture, there were years of solid residue and what looked like mold. I didn't want to take any chances with the mold so took the cleaning a step further than usual using Sodium Percarbonate to go deeper than Clorox bleach would. Clorox bleach will only remove mold on the surface, it does not penetrate a porous surface or reach out of site spores & their tentacles, percarbonate does penetrate though. Yixing is somewhat porous,with tinny pores all over, the advantage of simmering in fresh water is that it helps to remove a greater amount of residue left over from the last user and or storage mildew. If the pot is not very dirty then this step might not be necessary. Prolonged exposure to high heat during simmering helps to unclog those small pores giving them a deep cleansing bath. Thanks for bringing it "home". I tried it myself and it works really well. this was for sure the dirtiest pot i've worked on. it might be by Jozan II (1897-1961). i soaked it in boiling water a bunch, worked it with a toothpick, and then moved to scrubbing it with baking soda paste (used as mild abrasive) with a brush, cloth, and qtips. the filter could use a little more work, but it's clean enough now that i'm comfortable with using it. Oh wow, that’s a great clean up job pedant and a beautiful Jozan too. Did you soak it overnight with anything? The residue luckily didn’t look too black or moldy. Ha! I think I know where you got this pot from! I do not think it is Jozan II. All the Yamadas before Jozan III where finished pretty clean, more Chinese in their style. Even the early Jozan III have no fingermarks or purposely unfinished rough bits. At least Jozan III or IV in my opinion. I did a little research myself on them recently and it seems to me that Jozan I and II, as well as early III, only used seals to sign their work. The hand carved signature seems to be later. At least I have not seen any confirmed pieces which had it. Jozan III hand signed pieces, don’t have enough info on I or II hand signatures, just a few here and there. It would surprise me if they didn’t also hand sign, if you have info please share. Pedant’s Jozan II above has correct signature though and clay looks to be II. All generations hand signed their boxes. But keep posts about cleaning your Jozan ..
@pedant nice examples! Had not come across these. Thanks to the cloud knowledge I know more now! the pot was mostly clean, but i decided to give the baking soda soak method another shot. before, i thought it wasn't helpful, but now i'm undecided. it seemed to really loosen up the remaining tea stain, but it could have just been due to a long, hot soak in an insulated cooking pot. maybe plain water would have worked just as well. sadly, i'm out of dirty pots to test further. i put a lid on the steel pot, insulated it with blankets, and left it overnight. in the morning, the water was still warm, and the remaining tea stain wiped away pretty easily. i'm not sure if it was due to the baking soda or the prolonged high temp soak. however, it seemed to leave a bit of white mineral precipitate on some parts of the pot, so i soaked it in hot dilute vinegar for about an hour before giving it a final soak in hot water. Nice to get your additional working solutions. I’m sure having the pot in heated water overnight helped a lot to loosen staining. Also, since Baking Soda is alkaline at ph 9 it helps to dislodge built up residue and vinegar at ph 2-3 is more acidic, so is a perfect combination to get gunk dislodged. I use them together to clean drains with lots of fizzing action going on. Good idea to soak the pot in vinegar water after the overnight baking soda bath, recently I cleaned a porcelain houhin with some baking soda and I think a little bit stayed behind inside the spout ruining my next tea season. I recommend you now season your clean pot, placing it in a tea bath and then using it as a tea pitcher for a week or so. Just this week I noticed a glazed but porous tea plate that when wet smelled of smoked pu’erh. 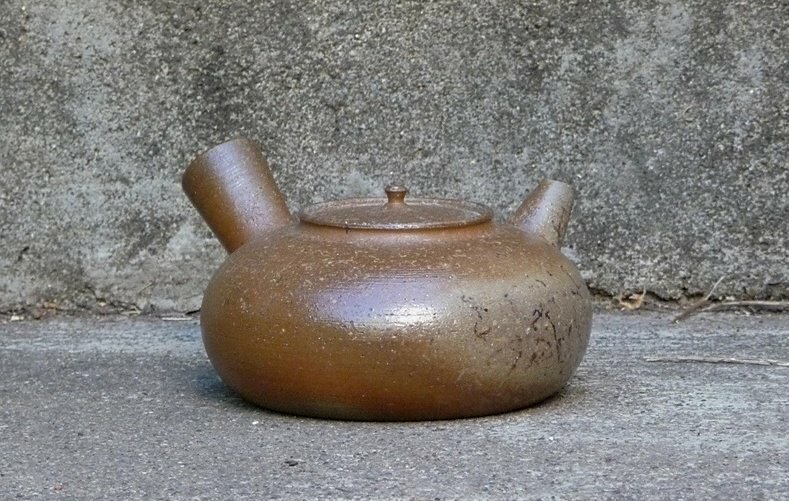 It had been used to hold teapots for extended pu’erh sessions. I soaked the plate overnight in a solution of vinegar and water +-50/50. Voila no more pu’erh scent and no vinegar smell either after the plate dried out.